Action: Discard the top card of your deck. If you discarded a Chthonian character, choose and destroy a non-Ancient One character. Otherwise, choose and destroy a Location support card. 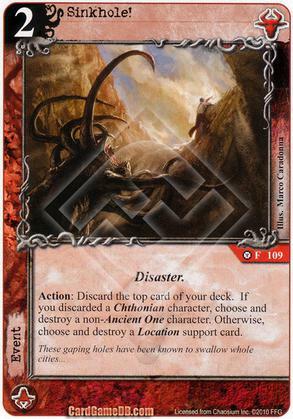 Between the spoiled Chthonian in The Thousand Young and all the upcoming "reveal the top card of your deck" effects, Sinkhole's looking pretty cool. Really nice catch, this might actually be worth building some stuff around, then. But, you also need a repeatable reveal effect and maybe some patience to have the right card on top too, either that or a way to put it there yourself which can already be done several ways. Does this remind anyone else of Tremors?